Troop 75 meets Monday nights at 7:30 pm in the Family Life Center at Transfiguration Catholic Church (1815 Blackwell Road, Marietta Ga. 30066). As the Scoutmaster for Troop 75 at the Catholic Church of the Transfiguration in Marietta, I would like to thank you for your interest in Scouting and our Troop and welcome you to visit us at one of our Monday night meetings and consider joining us on our adventures. Troop 75 is 36 years old, and this year we have renewed our commitment to running a Scout-led, adult-mentored, top-notch program. Our Scouts are genuinely excited to be given the opportunity to lead, the adult support to plan, and the tools to grow within all that Scouting BSA has to offer. Our annual programs have typically included – in addition to Camporall, Camporee, and Summer Camp – caving, water sports, backpacking, camping, merit badge clinics, and a high adventure trip (Northern Tier this past June, Philmont the next!) We also support our Scouts’ participation in NYLT (leadership development camp) every summer and encourage them to earn the religious awards for whatever faith they profess. Finally, our Scouts participate in several fund-raising activities each year, from the AAC’s camp card sales, to our own Christmas Tree sales, among others. 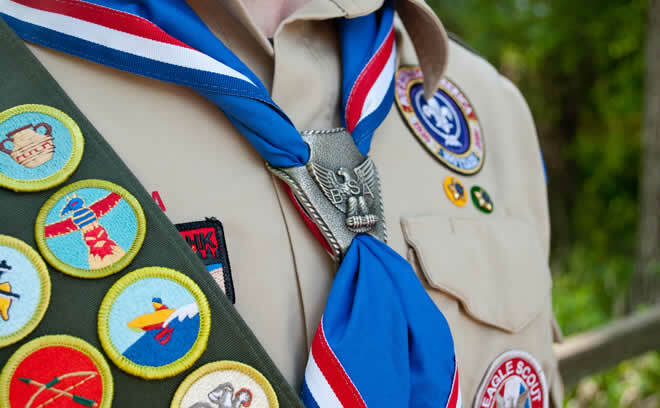 Troop 75 supports and encourages the Scouts to go as far as they desire in the program, including the rank of Eagle Scout (and palms beyond!) if that’s what they strive for; we are all about helping the Scouts become the best people they can be, grounded in our shared Scout Oath and Law. Our Scouts come from a variety of schools, churches, counties, and backgrounds, and we’re sure to have a place for your Scouts. For more information on Troop 75, please feel free to check out the rest of our website or contact one of our leaders. Our calendar on this site is updated regularly to indicate our meeting times and future outings. I hope to meet each of you soon!